Lu Xin, 24 yeras old from Hunan, joined Foxconn Group on Aug 1 2009, part of Foxconn’s 2009 management trainee program. After the incident Foxconn gathered relevant employee, and reported to media. Investigation found, Lu Xin exhibited abnormal behavior prior to May 1 holiday, having thoughts of being chased. Foxconn then arranged employees familiar with Lu for councel and conversation, also contacted Lu’s family to provide care. Despite of these efforts, tragidy was not averted. I ran across this recent blog entry posted by Chris Biddle, an American student living in China. It’s short, sweet and to the point. The stories out of Qinghai tell thousands of tragedies but also many small acts of heroism. Since the story is developing, with people still being saved, and since I am not on the ground: I will refrain from writing or commenting on the disaster. However, I will try to translate small stories here and there in the coming weeks to give people more of a flavor to what is going on on the ground. Apologies for the cheesy Susan Boyle comparison in the video and the introduction of the song by a western singer before she launches into it. What impressed me the most about this lady was her great attitude. This may not be a profound truth that I just discovered, but have you noticed that Chinese food and Chinese thinking have a lot to do with each other? Obvious as it may seem, one can become more reflective after encounters with another type of food and thinking behind it. In my case, the comparison is between China and America. 1. In cooking we don’t have “1 cup”, “1/4 cup”, “1 teaspoon” measurement, we say “a little salt”. Exactly how little is little, it’s all a matter of exposure (to other cooks), exchange (of experience) and experience (of your own practice). We don’t have “preheat oven to 425 degrees” either, we say “small fire”, “medium fire”, “”big fire”. Scratch your head and think what these mean. The Chinese mind is similarly conditioned to process such chaotic vagueness with ease and patience. We’ve written about China’s music scene in the past and remarked how few hip bands actually tour the country. Most of what appears are singers and bands that saw their heyday decades ago. With the help of Louis Yu, Vancouver’s own Immaculate Machine is currently touring China. 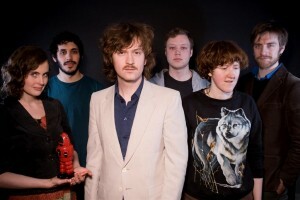 They are a side project of the New Pornographers, and their newest album, “High on Jackson Hill”, featured appearances by Alex Kaprano of Franz Ferdinand and members of the Cribs. They’ve also worked with such famous performers as Neko Case and AC Newman. So for all our readers who live in China and wish they could see more quality acts, here’s your chance to catch a hot band that really knows their stuff. Their concert dates are after the jump.